This report aims at providing an overall analysis of SME loan disbursement, repayment behavior of the borrowers and the reconciliation of Jamuna Bank Limited. Before going analysis, it is mandatory to know something about the organization, its core product that bank offer to the customers. As a conventional bank branch it has a SME banking section where the primary task of giving loan to the Borrower’s in short term or long term services are done. It performs the job of fund management on behalf of the whole bank. Other main duty of the department is maintenance of the accounts and dealing with the clearinghouse. In this age when management requires proper flow of accurate information to run an organization successfully than the banks way of information handling is quite outdated from the view point of sophisticated management information science. Facts and figures of the branch clearly indicates that the Savar Branch of Jamuna Bank Limited is as well run branch and the trends of graphs shows a sign of improvement and expansion of activity in all SME banking. Banking industry is one of the promising industries of our country. There are different types of banks such as; Commercial Bank, Agricultural Bank, Industrial Bank, Saving Bank and Exchange Bank. But when we use the term ‘Bank’ without any prefix, or qualifications, it refers to the ‘commercial banks’ are the primary contributors to the economy of a country. It helps to flow funds from surplus units to deficit units and through this it facilitated the efficient allocation of the resources as well as accelerated economic growth. This sectors is moving towards new dimensions as it changing fast due to competition, deregulations and financial reforms. SME loan is the financial support small and medium sized enterprise and represents major function of the general business finance market- in which capital for firms of types is supplied, acquired, and priced. Capital is supplied through the business finance market in the form of bank loans and overdrafts, leasing and hire-purchase arrangements; the economic and social importance of the small and medium enterprise (SME) sector is well recognized in academic and policy literature. SME loans Bangladesh change the Bangladesh economy there are many people get this loan and growth his business. Bangladesh many bank and finance leasing company get this loan many sectors trading, manufacturing. to fulfill the requirement of internship of BBA program of Business Administration. The topic for this report was decided upon after approved by Prof. Mohan L Roy Business department of IBAIS UniversityBangladesh. The general objective of the study is to analyze the SME loan disbursement of Jamuna bank ltd. Savar branch. To know the SME loan and its different products of Jamuna Bank ltd. Savar branch. To be acquainted with SME loan recovery procedures of Jamuna Bank ltd.
To know about the management system of Jamuna Bank Limited as a private commercial bank, its formation, and its functional, operational, and financial aspects. To make a comparative analysis of different kinds of loan with SME loan scheme. To determine the most important attributes of service quality about SME loan Analysis and Disbursement Process of JBL. Methodology includes direct observation, face-to-face discussion with employees of different departments, study of files, circulars and practical works. This study includes both quantitative and qualitative data of 2008-2011. However, this report is basically qualitative in nature. In all the cases depending on the requirements data have been collected from different sources. This report is based on both primary and secondary source of information. Annual Report 2008-11 of Jamuna Bank Ltd. Different publications regarding banking functions, operation, and transactions policies. Official documents and File study. Economic condition of Bangladesh is underdeveloped economics. One of the reasons may be its underdeveloped banking system. Modern banking system plays a vital role for a nation’s economic development. Over the last few years the banking world has been undergoing a lot of change due to deregulation, technological innovations and globalization etc. These changes also made revolutionary changes of a country’s economy. Present world is changing rapidly to face the challenge of competitive free market economy. It is well recognized that there is an urgent need for better-qualified management and better-trained staff in the dynamic global financial market. In this regards, Jamuna Bank Limited is a scheduled commercial bank. Through financial intermediation the bank seeds avenues for employment of its funds where there is profit as well as where risk is the minimum and the cost of administering loans is low. There is profit: It means that JBL considers the prospective as well as profitable sectors for the employment of its funds which will ultimately bring profit for the organization. Risk is the minimum and the cost of administering loans is low: It means that JBL goes for the prediction of risk as well as the cost of administering loan in case of investment decision. While profit motivation remains the prime consideration for viable operation and growth of the bank, the bank would also respond adequately to the socio-economic objectives formulated by the government from time to time for accelerating pace of economic development of the country. This investment options shall be chosen through skillful and prudent evaluation by the bank officials of feasibility of the proposed ventures including measures to minimize risk factors. The entrepreneurs would provide or hire managerial; skills, technology for production, marketing and servicing thereby diminishing the risk of investment. The study would focus specially SME Loan disbursement and recovery process along with general banking activities. The study has covered a curtail idea on JBL, taking proposal of SME loan, analyzing credit and performing activities for sanctioning loan by SME department of JBL. Mentioning that, operation of SME departments are closely related to other department’s activity as well. This will eventually refer that how the bank help customers securing their cash and assets, getting credit facility, repaying loan amount and bank’s regulatory compliance, lending policy etc. Although the officials were so busy, they gave wholehearted cooperation in the time of internship also in preparing this report. There have some limitations to make this report perfectly. Sufficient books, publications and figures were not available. If this limitation were not been there, the report would have been more useful. As JBL Savar Branch has been established at December, 2008 financial statement and other performance in terms of SME Loans are not be compared year to year. Limited access to necessary information preserved by the bank. Load at the work place was also a barrier to prepare this report. Due to lack of experience, there may have been faults in the report through maximum efforts have been given to avoid any kind of mistake. Another limitation was that the data gathered could not be verified for accuracy. The lack of intellectual thought and analytical ability to make it a perfect one. Finally, the length of this internship program (12 Weeks) is not sufficient conduct a detailed study on the subject of research. Jamuna Bank Limited (JBL) is a Banking Company registered under the Companies Act, 1994 with its Head Office at Printers Building Bhaban,3 Dilkusha C/A, Dhaka-1000. The Bank started its operation from 2nd April 2001. Jamuna Bank Ltd., the only Bengali named new generation private commercial bank was established by group of winning local entrepreneurs conceiving an idea of creating a model banking institution with different outlook to offer the valued customers, a comprehensive range of financial services and innovative products for sustainable mutual growth and prosperity. The sponsors are reputed personalities in the field of trade, commerce and industries. Jamuna Bank Limited is a highly capitalized new generation Bank with an Authorized Capital and Paid-up Capital of Tk. 4000.00 million and Tk.1622.00 million respectively in the 31st March 2010. Currently the Bank has 66 (sixty six) branches- 29 branches in Dhaka, 10 branches in Chittagong, 09 branches in Rajshahi, 03 branches in Sylhet, 02 branches in Comilla, 01 in Barisal and except branch in another districts. Last branch has been opened at Chittagong. Jamuna Bank Limited is a fast growing private sector bank in Bangladesh. This is a third generation private commercial bank. It has created a new horizon of its own in the banking arena of Bangladesh in terms of service to the customers. The bank has expanded and consolidated its customer base in both of its core businesses and retail banking. The Bank undertakes all types of banking transactions to support the development of trade and commerce in the country. JBL’s services are also available for the entrepreneurs to set up new ventures and BMRE of industrial units. To provide clientele services in respect of international trade it has established wide correspondent banking relationship with local and foreign banks covering major trade and financial centers at home and abroad. Jamuna Bank Limited is operating branches on both conventional interest based banking and Islamic Shariah Principle based Banking. The Bank starts Islamic Shariah based banking by opening an Islamic Banking Branch at Nayabazar, Dhaka. The Islamic Banking operations are completely separate from the conventional banking. To earn and maintain CAMELS Rating Strong. To establish relationship banking and improve service quality through development of strategies marketing plans. To introduce fully automated system through integration of Information Technology. To raise capital up to Tk. 4000.00 million by 2010 through the right share issue. 80 percent works have been performed to raise capital within due time. To review and update policies, procedures and practices to enhance the ability to extend better service to customers. To train and develop all employees and provide them adequate resources so that customers’ need be reasonably addressed. To become a leading banking institution and to play a pivotal role in the development of the country and service so that sustainable growths, reasonable return and contribution to the development of the country can be ensured with motivated and professional work-force. Jamuna Bank’s aim is to satisfy customers with high quality service that reflects the global image as the premier international bank, to become a leading banking institution and to play a pivotal role in the development of the country. The bank committed to satisfy diversified needs of its customers through an array of products at a competitive price by using appropriate technology and providing timely service so that a sustainable growth, reasonable return and contribution to the development of the country can be ensured with a motivated and professional work-force. The value of Jamuna bank Ltd. is “Your Partner for growth”. Legal Form : Jamuna Bank Limited (JBL) is a Banking Company registered under the Companies Act, 1994 with its Head Office at Printers Building 3, Dilkusha C/A, Dhaka-1000. Auditors : M/S Howladar Yunus & Co.
Tax Consultant : Howladar, Yunus & Co.
Savar is a very potential area where many business people gather to do business. To fill up huge demand 25 private and public banks have been established and do business with profitability. Jamuna Bank Savar Branch has been established at 15th December 2009 located House no. 40 (1st & 2nd floor) Savar Bazar Road, Savar. Within two years it is becoming popular day by day among various customers by offering multiple products and services. Jamuna Bank Limited is the member of SWIFT (Society for Worldwide Inter-bank Financial Telecommunication). SWIFT is a member owned co-operative, which provides a fast and accurate communication network for financial transactions such as Letters of Credit, Fund transfer etc. By becoming a member of SWIFT, the bank has opened up possibilities for uninterrupted connectivity with over 5,700 user institutions in 150 countries around the world. To provide International Trade related services we have established Correspondent Banking relationship with 336 locations of 106 world reputed Banks in more than 100 countries.JBL main Correspondent Banks are: Citi Bank N.A., Standard Chartered, American Express Bank, Bank of New York, Bank of Nova Scotia, , Dresdner Bank AG, Habib American Bank, Habib Bank, Commercial Bank, Shinhan Bank, State Bank of India (Canada) UFJ Bank Ltd., United Bank of India, Bank of Bhutan and Allied Bank Philippines etc. Jamuna Bank Ltd. offers a complete range of advisory, financing and operational services to its corporate client groups combining trade, treasury, investment and transactional banking activities in one package. Whether it is project finance, term loan, import or export deal, a working capital requirement or a forward cover for a foreign currency transaction, Corporate Banking Managers will offer you the accurate solution. Personal Banking Division (PBD) issues both VISA Debit Cards and VISA Credit Cards. VISA is the renowned Card brand in the earth. Jamuna Bank Limited is a principal member of VISA Worldwide. Remittance Cell is another successful wing of the Personal Banking Division. With large ATM of JBL network including non-branch ATM across the country you have the privilege of round the clock withdrawal and other account services at your convenience. Customer can enjoy higher ATM withdrawal limit each day. No fees on retail purchase and can use our Credit Cards at thousands of retail outlets around the world. ATM service available in all over the country Withdrawal allowed from ATM’s/VISA logo of Jamuna Bank Ltd., AB Bank, The City Bank, Janata Bank, IFIC Bank, Mercantile Bank, Pubali Bank, Eastern Bank Ltd, Dutch Bangla Bank Ltd, respectively. Jamuna Bank Ltd. has a network of branches in Bangladesh and more branches are going to be added to network soon. Remittance services are available at all branches and foreign remittances may be sent to any branch by the remitters favoring their beneficiaries. Remittances are credited to the account of beneficiaries instantly through Electronic Fund Transfer (EFT) mechanism or within shortest possible time. Jamuna Bank Ltd. has correspondent banking relationship with all major banks located in almost all the countries/cities. Jamuna Bank Limited has been nominated as a Primary Dealer by the Bangladesh Bank for trading 5, 10, 15 and 20 Years Treasury Bonds and other Government Securities. (ii) Individuals and institutions not resident in Bangladesh shall also be eligible to purchase the BGTBs. JBL has the authorized capital of the Bank is Tk. 4000.00 million of 1,60,00,000 ordinary shares of Tk. 100 each and the paid up capital of the Bank is Tk. 1313.27 million divided into 4,290,000 ordinary shares of Tk. 100 each fully paid-up in cash. The following table shows the amount of fund indifferent sectors of JBL. The following table expresses the following situation JBL. Profit is the amount of outstanding after deduct of all kinds expenses from the total earning amount. Table: 4 – Profitability of Jamuna Bank Ltd.
Bank deals with others asset to earn profit. Deposit is the most important source of bank fund. 90% of banks fund is collected from deposit. Deposit is always been termed as the life-blood of a commercial Bank. In the year 2008, Due to many uncertainties on economic front, significant pressures on economic performance and among others, the adverse impact of devastating flood in July-September and among others, the adverse impact of devastating flood in July-September 2007, declining trend in interest rates, Jamuna Bank Limited was able to increases its customers confidence and mobilized a total deposit of Tk. 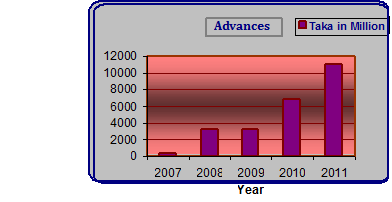 14,454.13 million registering a growth of 38, 31 percent over 2004. The total deposit position of the bank was Tk 10,450.16 million in 2004.Efforts are being made for augmentation of low cost deposit in order to accommodate good customer at a competitive price. SME is an additional and specialized horizon of the bank which serves the banks special focus in promoting broad based participation by catering to the small and medium entrepreneur. The network of SME has already been established throughout Bangladesh. SME are recognized as engine of economic growth and employment generation for sustainable industrialization in both developed and developing countries of the world. In context of Bangladesh, there is no alternative of small and medium enterprises for rapid industrialization and national economic growth through lower capital investment and employment. The SME Foundation is playing its role in helping the SME entrepreneurs including the women entrepreneurs by conducting various programs with an aim to develop the SMEs of Bangladesh. One of the major aims of SMEF is to bring the grassroots entrepreneurs into the main stream of economic development through employment generation, reduction of social discrimination and poverty alleviation. It is usually defined as one’s ability to buy with a promise to pay. From a banker’s point of view, credit is the confidence of the lender on the ability and willingness of the borrower to repay the debts at a future date. Banks charge a higher interest for loans than the deposit rate given to customers. The difference in rates is the profit for a bank. 80% of a banks profit comes from the interests. Loans and advances comprise a large portion of banks assets and this is the backbone of a bank’s structure. The strength of a bank is primarily judged by the soundness of its loans and advances. So, the loan and loan department is a very important department of a bank. Loan policy is very important. If a bank takes very strict loan policy, then the amount of loan will be less. If the loan polity is flexible, then the amount of loan will be much. But strict loan policy leads to lesser bad loans. Sometimes, loan policy cannot prevent customer’s bad intention of not adjusting loans. This is why; strict loan policy is very necessary for every bank for the safety of their investments. JBL SME Loan Policy contains the views of total macro-economic development of the country. As a whole by way of providing financial support to the trade, commerce and industry throughout its loan operation JBL goes to every possible corners of the society. They are financing large and medium scale business house and industry. At the same time they also take cares entrepreneur through its operation of lease finance and some micro loan, small loan scheme etc. The bank has come up with a scheme where women will be given financial support for their self-employment and development. Delegated powers are expected to be exercised by the authorized executives sensibly keeping the bank’s interest in mind. In exercising the power so delegated authorized executives shall also have loan restriction, tools and regulations as governed by Banking Company Act, Bangladesh Bank, and other usual loan norms. A customer to whom loan is to be allowed should be far as possible within the command area. .
No sanctioning officer can sanction any credit to any of his near relatives and to any company where his relatives have financial interest. There are some common regulations governed by Banking Company Act, 1991 Bangladesh Bank and the law of the State which has to be followed strictly at the time of screening a loan proposal. In addition loan proposals are appraised critically by JBL loan officials from various angles to judge the feasibility of proposal. The customer at the branch of the bank place loan proposals. When a customer comes with loan proposal, the loan department officials of the branch make an open discussion with the customer on different issues of the proposal to judge worthiness of the proposal and customer. If the proposal seems worthwhile in all aspect then the proposal is placed before loan committee of the bank. After threadbare discussion, if the committee agrees in principle the proposal is sanctioned as per the delegated business power of the branch. However, if the magnitude of the proposal is beyond the delegated business power of the branch they forward it to the Head Office with recommendation for sanction or approval. On receiving the proposal, the Loan Division of Head Office places the proposal in the Head Office Loan Committee. The committee further analyzes proposals critically and if agree in principle they sanction the same as per delegated business power. Again if the merit and magnitude of the proposal is beyond the delegated business power of the Head Office Loan Committee or Managing Director they forward proposal to the Board of the Bank with recommendation for approval. If the proposal is found unviable at the branch level they decline the same from their desk. In the same way, proposals are also declined from the Head Office Loan Committee and from Board if it is not feasible. Savar Branch of JBL successfully deals following loan with potential customers. Capacity: Make sure that the individual or the company they are lending has the capability of repaying the loan. Capital: Make sure that the individual or the company they are lending has an appropriate level of investment in the company. Collateral: Make sure that there is a second way out of a loan but do not allow that to drive the loan decision. Carelessness: They believe that documentation, follow up and consistent monitoring is essential to high quality loan portfolio. Communication: They share loan objectives and loan decision making both vertically and laterally within the bank. Contingencies: Make sure that they understand the risk; particularly the downside possibilities and those they structure and price the loan consistently with the understanding. It is essentia1 that the proposals define clearly the purpose of the facility, the sources of repayment, the agreed repayment schedule, the value of security (land, machinery, security papers, bond, sanchaypatra etc.) and the customer relationships consideration implicit in, the loan division. Where the security is to be accepted as collateral for the facility all documentation relating to the security shall be in the approved from. All approval procedures and required documentation shall be completed and all securities shall be place prior to the disbursement of the facility. A document is a written statement of facts of proof or evidence arising out of particular transaction, which on placement may bind the parties there to answerable and liable to the law for satisfaction of the charge in question. The execution of documents in proper form and according to the requirements of the law is known as documentation. The documentation does establish a legal relationship between the lending bank and the borrower. The terms and conditions of loans and advances, the securities charged and the repayment schedule are recorded in writing. Proper documentation is necessary to safeguard the future interest of the bank. All required Documents as mentioned before should be obtained before any loan is disbursed. Disbursed of any loan facility requires approval of the component authority that should ensure before exercising such delegated authority that all the required documentation have been completed. Loan Facilities Extended by JBLThe main functions of a commercial bank are two: 1) to take deposit and 2) to make advance. Making advance is the most important function of a bank. This depends on the profitability of the bank. Moreover, Bank make advance out of the deposits of the public which are payable at demand. A Commercial Bank makes advances to different sectors for different purpose i.e. financing of Trade and Commerce, Export and Import, Industries, Agriculture, Transport, House-Building etc. Small businesses play a significant role in the socio economic development of a country. Irrespective of the systems of the economy, growth stage of the country, place of industry in the economy, use of skill and technology in any country small business plays an important role which none of the concerned people dare to undermine though small in size but small business and their entrepreneurs are big with large potentiality. Jamuna Bank limited Savar Branch has also launched this SME policy for small businesses. The role of Small and Medium Enterprises is very crucial in the economic development of the country. SME plays the vital role for employment generation, particularly self-employment by making significant contribution of 25% to GDP. As a part of commitment, JBL may substantially contribute to the socio-economic development of the country providing financial support to the Small and Medium Enterprise sector. * Loan Application from duly signed by the customer. Loan Application form should be accompanied by a ‘Borrower’s Basic Fact Sheet’s Basic Fact Sheet’ under the seal and signature of the borrower. Various facilities already obtained from other institutions. * Acceptance of the terms and conditions of Sanction Advice. * Photographs of the proprietor / partners / directors duly attested. * Personal net worth statement of the proprietor / partners / directors. * Copy of TIN Certificate. * Short description of the products of the enterprise. * Project Profile (if new project). * Marketing / distribution system of the company. * Short profile of the proprietor / partners / directors mentioning their business experience / education etc. * Brief description of the management of the company mentioning their educational professional experiences. * Name and address of the sister/allied concerns. * Name and address of present bankers. * Loan information Bureau (CIB) report from Bangladesh Bank. * Wherever practical, insurance policy for 110% of the stock value covering potential with bank’s mortgage clause in joint of the bank and client. 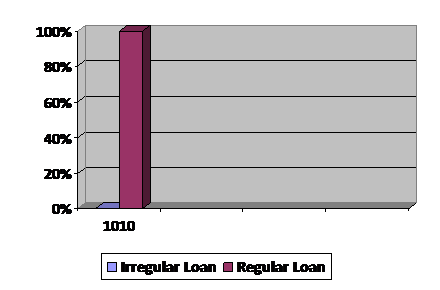 Under this product, if the loan amount is covered by FDR up to 50% of the loan amount and the customer has regular cash-flow to pay installments and deposit of installments by the customer is followed up the loan is likely to be secured and for experienced customers with good past track record who have successfully repaid loan under Double Loan Scheme at least twice business cash flow has grown accordingly, loan facility up to 03 times of the FDR value may be considered. 1.1: Customer Segment : Any Small and Medium Size Entrepreneur. 1.6: Age Limit : Between 25 years to 50 years. 1.9: legal documents : as per documentation checklist. 1.15: Disbursement mode : Shall be disbursed in lump-sum/ at a time. It is very comfortable and convenient if SME’s can run the business from own office shop. A permanent place of business can serve rental expense and other hassles as well as can enhance loan worthiness of the enterprise in the market. But a mare dream to SME for want of fund at his disposal to purchase a business space/possession right. Because now-a-days it is too costly in the part of SME to materialize this dream from his own source(s). The following formalities should be followed by the SME- Loan for Purchase of business space/possession right. 2.1: Customer Segment : Any Small and Medium Size Entrepreneur. 2.3: Purpose : Purchase of business space/possession right. 2.6: Age Limit : Between 25 years to 50 years. 2.9: legal documents : As per documentation checklist. 2.15: Disbursement Mode : Direct to the seller. 50% populations of our country are women. Gradually women are coming out of homes. They are now working in different work places very successfully undertaking different innovative/creative ventures. Women entrepreneur having a financially viable productive venture. 3.1: Customer Segment : Any Small and Medium Size Entrepreneur. 3.6: Age Limit : Between 25 years to 50 years. 3.9: legal documents : As per documentation checklist. 3.15: Disbursement mode : Shall be disbursed in lump-sum/ at a time. Now-a-days, Office/Commercial space renovation with most modern interior and exterior decoration is essential to attract customers. But attractive interior and exterior design of a shop/office is too costly to afford by SME’s. To overcome this problem, JBL has come forward with a new product for SME customers named as “Shop/Office Renovation Loan”. The Shop/Office should preferably be owned/possession right purchased by the customers or minimum 10 years valid Lease Agreement with the owner. 4.1: Customer Segment : Any Small and Medium Size Entrepreneur. 4.6: Age Limit : Between 25 years to 50 years. 4.9: legal documents : as per documentation checklist. 4.15: Disbursement mode : One time. Most of the SME customers suffer from not being able to expand further the business due to lack of capital. But, business is an on going process and to survive the market BMRE of the project and procurement of vehicle is essential. Under this product, if the customer is able to provide 30% of the cost of machinery in the form of FDR and has regular cash flow to pay loan installments, then further security may not be insisted other then hypothecated stock and personal guarantee of the customer. 5.1: Customer Segment : Any Small and Medium Size Entrepreneur. 5.6: Age Limit : Between 25 years to 50 years. 5.9: legal documents : as per documentation checklist. 5.15: Disbursement mode : One time. Most of SME’s suffer from working capital shortage. Business is an ongoing process and to survive in the market, working capital is an essential. . To overcome this problem, JBL has come forward with a new product for SME customers named as “Working Capital/Trade Finance”. 6.1: Customer Segment : Any Small and Medium Size Entrepreneur. 6.3: Purpose : To meet Working Capital Requirement. 6.6: Age Limit : Between 25 years to 50 years. 6.9: legal documents : as per documentation checklist. In FY05 after adverse impact of devastation flood and declining trend in interest rate JBL, continued to explore its area of loan and was successful to build up a sizable quantum of loan, which stood at tk.11, 011.83 million as on 31.12.2005, registered an overall increase by 63.80 percent over 2006. 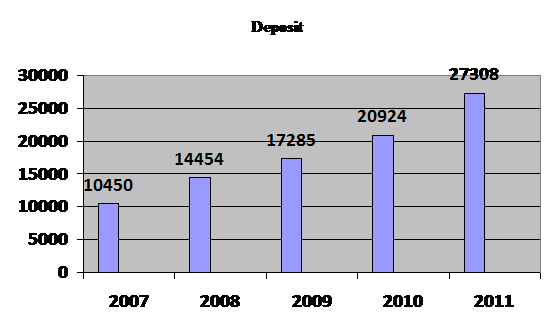 The total loan as on 31st December 2008 was Tk.6, 722.81 million. In compliance to regulatory requirement and to avoid risk of single industry or large loan concentration and to maintain the Bank’s loan excellence relating to proper risk management, yield exposure, tenor, collateral security proper valuation etc. the loan portfolio of JBL was further diversified. JBL’s loan facilities mainly concentrated on Trade Finance, Agriculture and related sector, project finance, wholesale and retail trading, service sector, transport sector ,hospital, small &medium entrepreneurs. This is one of the most important parts of Banks to earn Profit. 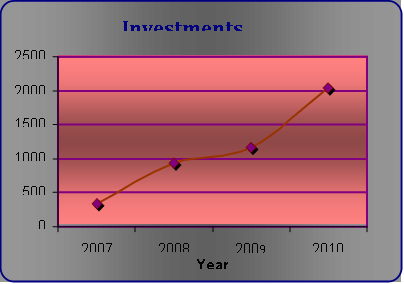 In December 2010s the investment was Tk.2037.87 million, growth rate 75.12 percent over Tk 1163.70 million of December 2009. The investment portfolio comprises Government Treasury Bills of Tk. 630.00 million, Treasury Bonds of Tk 875.00 million Prize Bonds, primary shares, Zero coupon bonds etc. Abdul Malek is a Business man. He is doing Business from three years at Savar Station Road. His business item is stationary things. To operate this business usually he suffered to keeping capital requirement for the business. For this reason he wanted to take loan from banks or any financial institutions. By this time he heard that Jamuna Bank is offering a package of working capital solution [50% revolving credit (cash credit) facility] to run the business properly. To get this loan Maximum up to 70% of the net required working capital or 75% of the sum total inventory (cost or market value whichever is lower) and net receivables (below 180 days older). But existing DSCR must be at least 1.75 for tenure of 24 month and below and DSCR must be at least 2.00 for tenure of above 24 month. Loan Amount: BDT 5.00 lac to BDT 50.00 lac. Tenure: For revolving loan- Maximum 01 year (Renewable). For Term Loan- Maximum 36 months. Interest Rate: Competitive interest rate. Fast and quality service. Registered Mortgage of Property is required. legal documents as per documentation checklist. Having business at least 2 years in the same line. Age Limit of the Borrower : 20 years to 60 years. Last twelve months’ sales statement. Last twelve months’ bank statement. Valid Trade License of last two years. National Voter ID/ Passport of the borrower. Photographs of the borrower and the guarantors. After completed all criteria Jamuna Bank sanctioned his loan. Mr. Malek doing his business successfully. And his record of repayment is very good. To procure machinery or vehicle for SME business purpose. Interest Rate: Competitive interest rate. Having business for at least 2 years in the same line. Age Limit: 20 years to 60 years. Utility bills of the concerned business. Mrs. Rabeya is most important client of JBL in Savar branch. She is doing business from five years. She has a flower’s shop in savar bus stand. She was started her business with small amount of money. After taking loan from JBL, savar branch, she expanded her business. About fifty percent of our total population is women and many of them have succeeded as a business entrepreneur. To give our incomparable ladies some extra ease and to help them to get financial freedom, Jamuna Bank Ltd. is offering a product ‘Jamuna Nari Uddogh’. To make your dream come true, JBL always with you as a true friend. Loan Amount: BDT 3.00 lac to BDT 50.00 lac. Tenure: For Trading and Service Industry 36 months. For Manufacturing industry 42 months. Interest Rate: 10% – the lowest interest rate. Up to BDT 25.00 lac is collateral Free. Having business at least 2 years in the same line of business. Age Limit: 25 years to 60 years. Last Twelve months sales statement. Last Twelve months bank statement of transactional account. National Voter ID/ Passport/ Ward Commissioner/ UP Chairman certificate of the borrower. Photograph of the proprietor and the guarantors. As JBL Savar Branch has been established at December, 2009, loan disbursement and recovery in amount can’t be compared with year to year But it pleasurable matter that this branch disbursed loan 9, 86, 00,000 taka in 2010. Majority parts of loan have being disbursed in continuous loan, recovery of loan will be held after two or three years by maturity of duration. Getting monthly income from interest of disbursed loan is higher than other income source of branch. In figure total sanction amount has been disbursed among borrowers . The main focus of Jamuna Bank Ltd. Loan Line/Program is financing business, trade and industrial activities through an effective delivery system. Jamuna Bank Ltd. offers loan to almost all sectors of commercial activities having productive purpose. Loan facilities are offered to individuals including housewives, businessmen, small and big business houses, traders, manufactures, corporate bodies, etc. Loan facilities are extended as per guidelines of Bangladesh Bank (Central Bank of Bangladesh) and operational procedures of the Bank. When loans become irregular in repayment, these loans are called classified loans. Classification of loans is the process of identifying those loan accounts and giving special attention to those loans by separating those loan accounts. Classification of loans also measures the level of risk associated with it. Every banks give loans and advances. But not all the loans are repaid by the borrower in specific time. There are some loans, the repayment of which is irregular. Banks find out these loans and give special treatment to these loans. Classified Loans: Loans, the repayment of which is irregular. Unclassified Loans: Loans, the repayment of which is regular. Substandard: Repayment is irregular, but it can be improved. Doubtful: Unlikely to be repaid but special collection efforts may result in partial recovery of the loan amount. · Bad or Loss: No chance is left for recovery of loan. Lack of update products is a drawback of the general banking area of the JAMUNA Bank. New products such as student loan, medical loan, marriage loan are not available in JBL. From the clients view introducer is one of the problems to open an account. It is general problem to all commercial bank. They face troubles with those clients who have not any knowledge in banking transactions and banking rules. As a result of technological change such as use of new software. There are few staffs that face to finish every task immediately so before utilizing new technology proper training should be arranged. The recovery of capital in small business loan section is threatened. JAMUNA Bank has insufficiencies of Authorized Dealer Branch in respect of the total foreign business. Bank has only six branches, which have AD licenses. As a result in total foreign exchange business is very small in respect of total market. The theoretical knowledge is obtained from the courses of study, which is only half of the way of the subject matter. The perfect coordination between theory and practice is of paramount importance in the context of the modern business world in order to resolve the dichotomy between these two areas. I got this chance in Jamuna Bank Ltd, Savar branch. Although this branch is newly established, I took worthiness experience on banking sector through this branch. Every officer was very co-operative to make me understand about whatever I wanted to know about banking. The Jamuna Bank Ltd. should concentrate more on its deposit products and offer more attractive interest rates than those offered by any other bank. For customer’s convenience, JBL should provide more personnel to deliver faster services to their honorable customer. Development of human resources should be ensured to increase efficiency in work..
More interest should be paid on deposit account so that customers are convinced to deposit their money in bank. Research and Development wing must be more extensive and rich. Effective strategies must be undertaken against defaulter. Branches should have a separate section to analyze the financial statement for fining its liquidity, profitability and ownership ratios. Bank should not give loans to aged clients. Specifically, client over 55 years of age (in Bangladesh context) should not be given loan. The Tax Payer’s Identification Number (TIN) must be made compulsory for applying for the loan. Bank should ensure that if a borrower dies, there are other capable persons who can take charge of the business and keep the business running without any interruption. The Jamuna Bank Limited is a strong and effective player in the financial system. It is a solid, forward-looking, modern local bank with a record of sound performance. It is a new generation bank. It is committed to provide high quality financial services/products to contribute to the growth of GDP of the country and the growth of industrialization, boosting up export, creating employment opportunity for the educated youth, raising standard of living of limited income group and overall sustainable socioeconomic development of the country. The bank has a vision to be the best private commercial bank in Bangladesh in terms of efficiency, capital adequacy, asset quality, sound management, etc. It is now one of the top most profitable private commercial bank in the country. The bank is maintaining a well-structured communication from top to bottom level. The work experience in the Jamuna Bank, Savar branch for the period of internship program was very educating. All officers of this branch were cooperative and very friendly in their attitude. Job environment in the Jamuna Bank is excellent. The bank must accept any failures and consider these as a persuasion to pursue future goals instead of looking back on the failures and it must keep looking forward to playing an important role in our economy. As a leading bank of Bangladesh, JBL contributes in the business with promising future. I can hope that JBL can spread their business with increasing various scheme and other utility services.